Accessories: Accompanied by Patek Philippe Extract from the Archives confirming production of the present watch in 1962 and its subsequent sale on June 15, 1962. Gilbert Albert is beloved for his novel and daring designs that completely departed from the quotidian during the 1950s and 1960s. 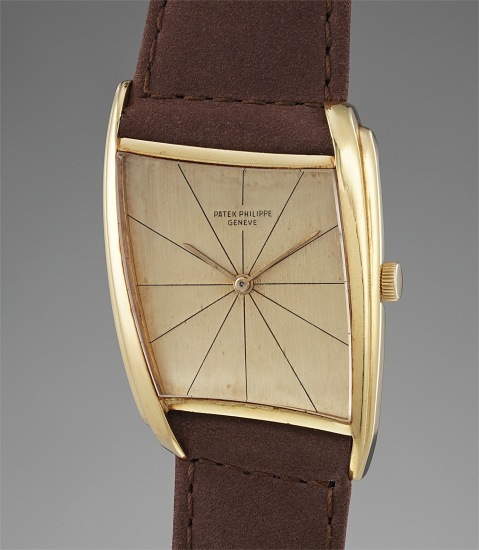 In 1955, Patek Philippe teamed up with the designer to produce a series of unusual wristwatches. The talented artist took inspiration from modern artists such as Brancusi and Mondrian, and his daring and unconventional case designs are considered as cutting-edge today as they were 40 years ago. Albert is known for his unconventional use of materials like coral, pearls and meteorite. The works have a harmony with nature in their form and color. There are few wristwatch models that have achieved a cult status like Gilbert Albert's Patek Philippe designs. Having resided in a private collection for many years, this watch is believed to be one of only four examples of reference 3424 in yellow gold with champagne dial and sector lines to have ever graced the auction market. With a crisp hallmark on the lug, the watch has been preserved in excellent condition.